After the hectic activity of the holiday season, I always find January offers a welcome change of pace. Yes, it’s sad to see the Christmas tree go, and take the holiday cards down. But then there’s all that white space opened up again, and there’s something kind of nice about that. January is the month for getting back to work, and it’s also been designated “Get Organized Month” by the National Association of Professional Organizers. Here are a few of our past posts that may help you in this sleeve-rolling-up, back-to-work mode of January. Wishing all of you a happy, healthy, and less cluttered New Year! 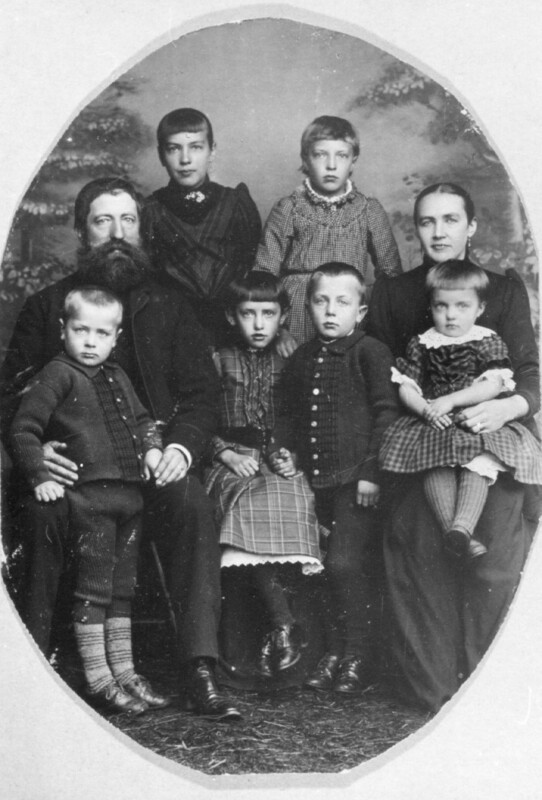 My grandfather’s family in 1893. My grandfather is center front, my cousin’s grandfather is on the left. The first page of our family history. When my cousin Cecilia visited from Sweden this summer, she told me that she had a family history that traces our family back to 1663. 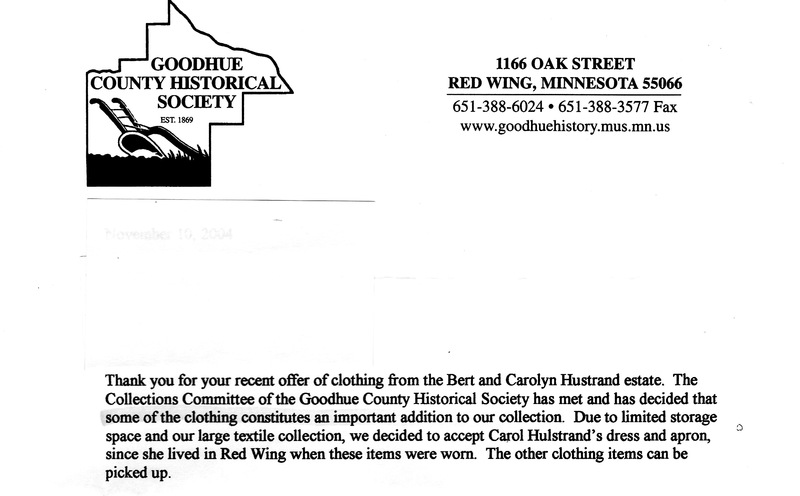 She sent it to me recently, just in time for Family History Month. 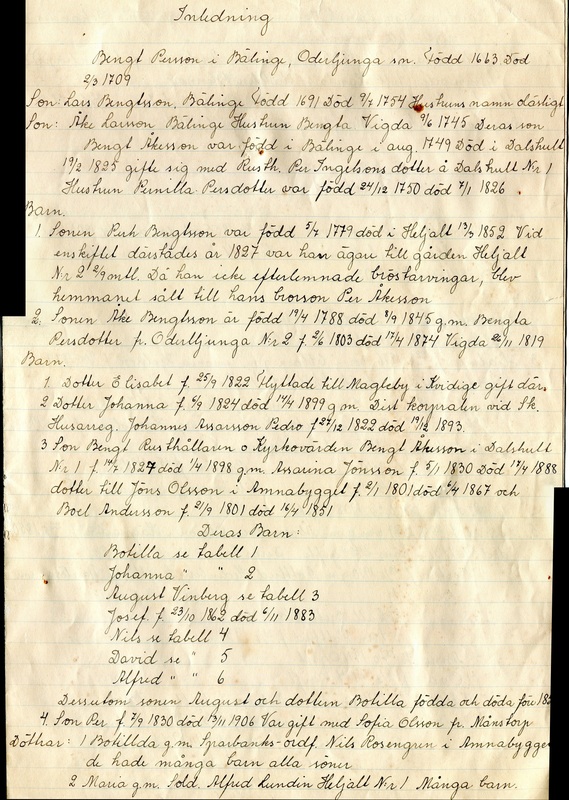 Our grandfathers were brothers and someone in her family has traced back our family, on our grandfathers’ mother’s side, to Bengt Persson, our six times great grandfather, a man who lived from 1663 to 1709. This is amazing to me. I’m so grateful to the person who researched this and to Cecilia and her husband Lars who preserved it and scanned it for us. The gift of the family tree sent me to my grandmother’s photo album and what fun it was to see some of the history in family photos. 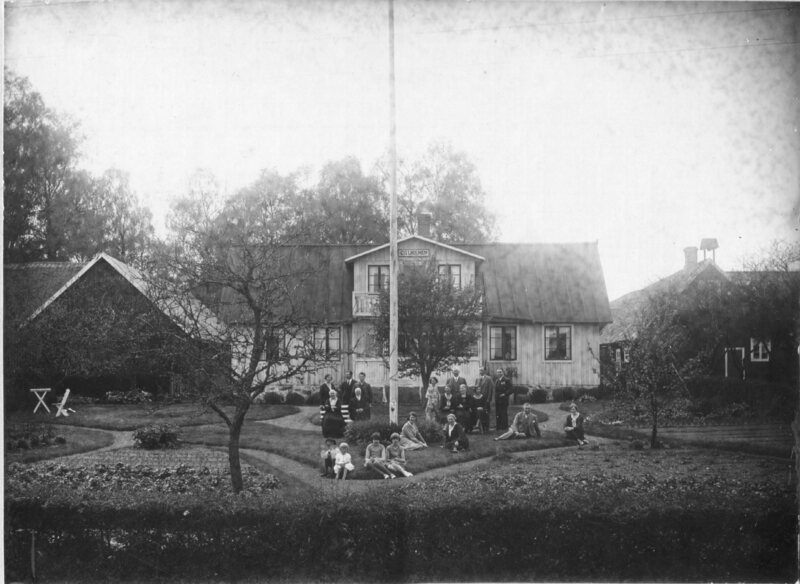 The family farm, called Gyllholmen, in 1930. 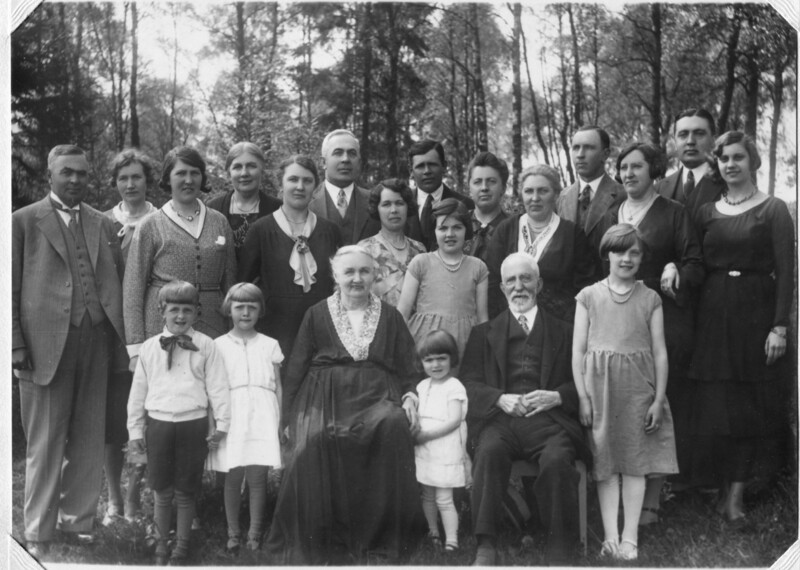 My great grandparents with their 10 children, some of their spouses, and a few grandchildren. For a previous post on Family History Month, I talked about school projects that got our family started on researching our history. And in another post, I listed some places that may help you get started researching your own history. You can also get some help from the experts. Family Tree Magazine has some suggestions for tracing your family tree. Family Search Blog lists activities for celebrating the month. On the Ancestry website, you can find family history events. Here’s hoping you find a special way to celebrate and honor the story of your family. The first generation born in the U.S. on a street in Brooklyn. My mother’s family on the left, cousins on the right. 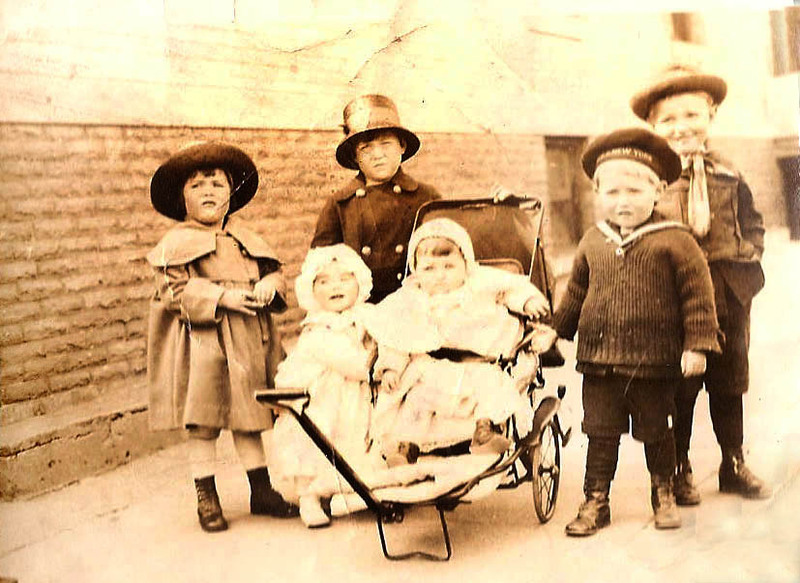 My mother is the baby standing by the carriage. This week has been National Preservation Week, a week when libraries and other institutions call attention to what we can do, both individually and collectively, to preserve our personal and shared collections of various kinds. And of course, in less than a month we will celebrate Memorial Day, honoring those who have given their lives in service to our country. 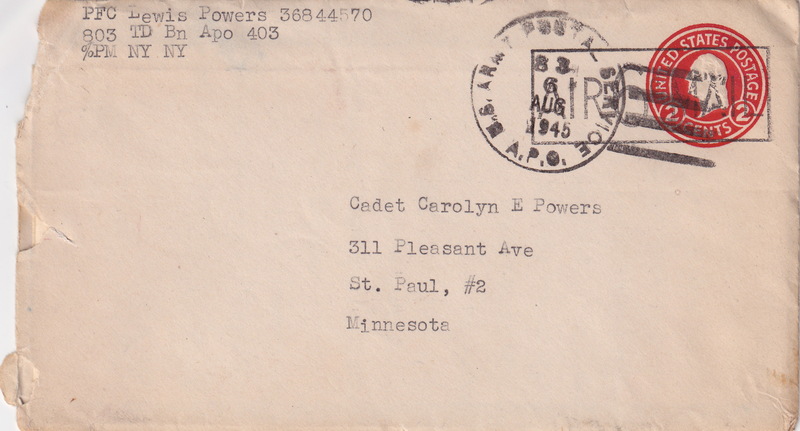 So this seems like an appropriate time to address the question of what to do with old war letters we may be keeping–or finding–in boxes or drawers, on shelves or in files, in our homes. Clearly, old war letters are not just “stuff.” They’re an important part of our collective history. They can be valuable to historians–and to the rest of us–in trying to help us understand wars as they have been experienced by those who lived through them, not just as they have been written about in history books. They should be honored, and preserved, as valuable documentation of servicemen and women’s lives: of the sacrifices they made, the fears they felt, the difficulties they overcame, the pride they felt in serving their country. 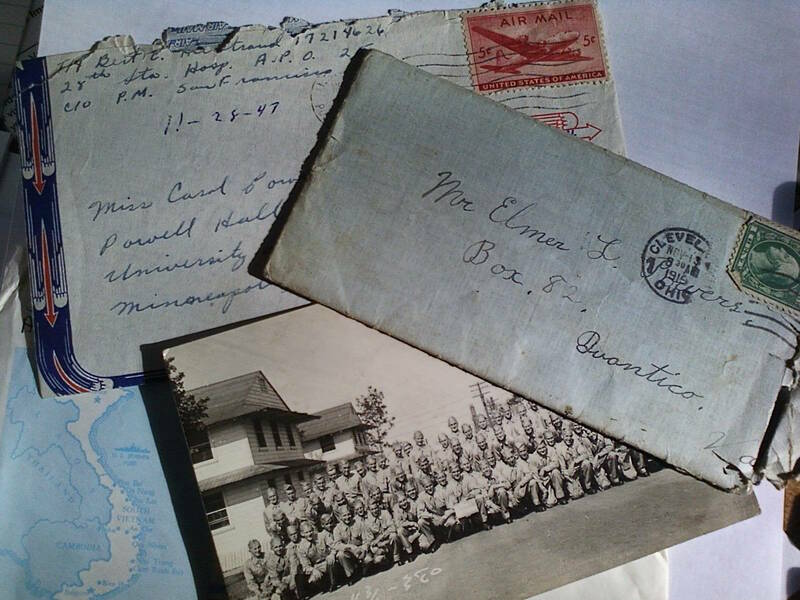 Keeping old letters in homes, especially in rooms where they are subjected to extremes of temperature and humidity, or to dust, is not a good idea. But how should they be kept, and where? That is really just a shame. So, as you work on downsizing or spring cleaning this year, you should know that if and when you are ready to find a safe home for any family war letters you may be holding onto, that now there is a safe place for them to be. And if you’re not ready to give them up yet, you can find good advice about how to keep them safe for posterity here. In our book, we talk about the fact that in the process of downsizing a family home, it often seems that the world is divided into the “keepers” and the “throwers.” And how in most families there are some of each personality type, and how one of the challenges in getting through the process harmoniously requires these two opposite types to respect each other’s differences, and find ways to cooperate, collaborate, and find a middle ground–to keep some things, and to get rid of many others. One of my cousins has been engaged in the process of going through all the things left behind by her recently deceased parents. And she has reminded me that in downsizing a family home, it’s not always just about keeping some things, and getting rid of others. Sometimes it’s about preserving things–not necessarily for ourselves, but for our families, or our communities. My uncle was a man deeply involved in his church, in his political party, and in his community. He was also by nature an archivist. After he died my cousin spent many hours, many days, many months going through his papers. At a certain point she called for help from the local historical society, who came to take a look at the overwhelming collection of documents she was dealing with. Ultimately they took 26 boxes of his papers, and were delighted to receive them. Several more boxes went to his alma mater, a small liberal arts college where he had sat on the board, and kept all his notes from board meetings over a period of many years. Other files were delivered to his church, and some were kept for the family. All of the recipients of these documents, which my uncle kept so carefully for so many years, deeply appreciated the care my cousin had taken in going through what many people would have simply thrown out. “When we talk about preserving things, it’s more about keeping things for others than for ourselves,” my cousin says. 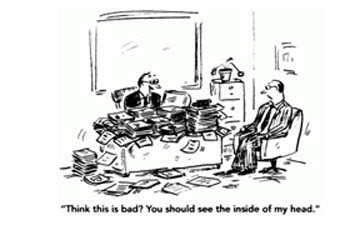 Of course the painstaking, often tedious task of going through papers is extremely time-consuming, and not everyone can do it. My cousin did not go through every piece of paper in her father’s office, she couldn’t! But she did at least look into every drawer, she tried to assess what was there, and what she couldn’t deal with herself, she gave to someone she knew would be able to do so. When it comes time to empty out the family home, it’s good to remember that there is another option presented than the strict dichotomy of “keeping” or “throwing.” And there are many institutions and organizations set up to help preserve those things we don’t know what to do with–but know somehow, should not just be thrown out. If you’re not sure where to turn or who to contact in your community, your local librarian can help. There is also help in the resource section of our book. Of course, this kind of painstaking care with preserving the artifacts and documentation of our collective history can’t be done in a weekend, or a month. In order to ensure that you will have the time needed to find the right place for everything to go, you’ll need to follow our first and most important piece of advice: start now!